A fact sheet is now available detailing a new bill before the California legislature that will maintain regulations for treate wood waste (TWW) disposal. The two-page fact sheet reviews Senate Bill 68, which will maintain the requirements in place since 2004. Current law allows TWW to be disposed in composite lined landfills and not be considered hazardous waste. It also requires wholesale and retail operations to post signs directing consumers to employ safe handling and lawful disposal practices. Click here to download the sign. WWPI is supporting the new bill. Working with other industry associations, WWPI is hoping to simplify the required sign in retail and wholesale lumber operations and make the regulation permanent by removing the sunset provisions that were in previous bills. Get schooled on preserved wood and fire retardant wood with the new online eUniversity developed by WWPI and online education service AEC Daily. Two courses are available in the eUniversity and each allow visitors to earn continuing education credits (CEUs) for taking the courses. CEUs are available from more than 20 associations, including American Institute of Architects (AIA), Landscape Architecture Continuing Education (LA CES), National Assn. of Home Builders (NAHB) and the National Assn. of the Remodeling Industry (NARI). The course Preservative-Treated Wood: Specification and Use provides a detailed overview on preserved wood products. Sections include how wood is preservative treated, specifying using AWPA Use Categories, Best Management Practices for aquatic wses and the environmental benefits of preserved wood. The full course can be downloaded as a PDF file, with links to the CEU test and other reference materials noted in the course. Protecting wood from fire is to subject of the second course, Specifying and Using Fire-Retardant-Treated Wood. Topics include a history of fire retardant wood and how those products are used in construction today. It explains how fire retardants work to protect wood, the applications and types of fire retardants that are available and the factors that should be considered to ensure FR wood products are properly specified for code compliance. The online courses provide a detailed understanding of how preservative-treated and fire-retardant-treated wood products are made and used today. They offer an extensive foundation of knowledge for contractors, designers and specifiers, as well as for those selling treated wood products. 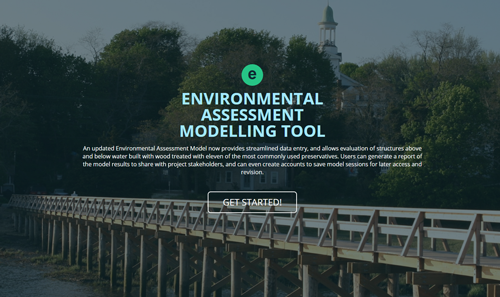 Determining any potential impacts from using preserved wood in aquatic or sensitive environments is now easier with a new, user-friendly Environmental Assessment Model. The online model streamlines the process of modeling the conditions for a project to estimate the potential migration of preservatives from preserved wood immersed or over water. It is based on pioneering research by Dr. Kenneth Brooks and has been peer reviewed, repeatedly field tested and proven to protect the environment. The model, which is also available as an Excel spreadsheet, has been used by the National Oceanic and Atmospheric Administration, U.S. Forest Service, Bureau of Land Management, U.S. Park Service, Environment Canada and Canadian Department of Fisheries & Oceans as well as a host of local and state regulatory bodies. For more information on the model, go to the Aquatics section or review materials in the Online Technical Library. Get the latest information for specifying Western preserved sawn products under the AWPA Use Category system with a new infographic and a special PreserveSpec technical guide. Both feature the up-to-date definitions from the 2016 AWPA Book of Standards and provide specific information to help select the right preserved wood product. The infographic, developed through the AWPA Education Task Group, shows the most common uses for preserved wood at homes. 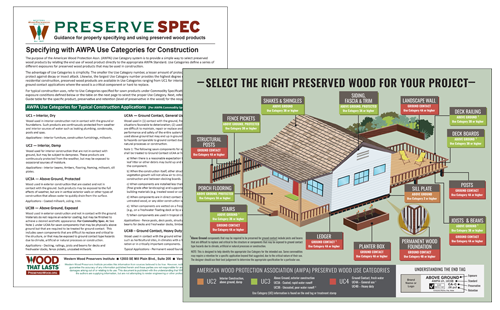 The PreserveSpec guide is the first in a new series of guides to assist those specifying preserved wood products for any project. Download the new publications from our exclusive online Technical Library. Safety data sheets, or SDSs, for wood preservatives can be downloaded or requested from the new Find SDS section. 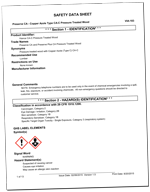 The new sheets, required by OSHA regulations, replace the Material Data Safety Sheets (MSDS) and must be provided to downstream users to communicate information on the hazards of the chemicals in the preservatives. The U.S. Army Corps of Engineers has settled a lawsuit brought by the preserved wood industry and has agreed to allow the use of preserved wood over and near waters or wetlands. Get the latest developments on preserved wood and the Western Wood Preservers Institute on our Facebook page. Be sure to like us to get our regular updates! 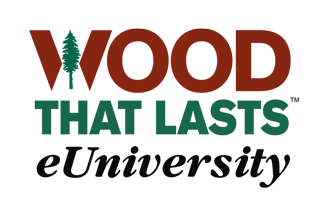 The best resource for Western preserved wood products is just a click away with the Preserved Wood Tech Library. The library offers an extensive collection of downloadable publications, technical sheets and design tools to properly select, specify and use Western preserved wood on almost any project. Check out the online library! Take a look at FireResistantWood.org today! There are many questions when it comes to selecting the right treated wood product. 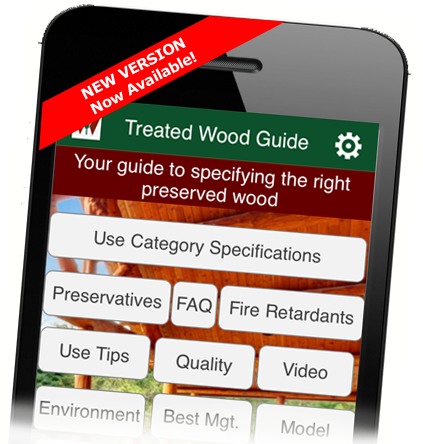 Have the answers right in your hand with the newly revised Treated Wood Guide app, available for free on your smartphone or tablet.